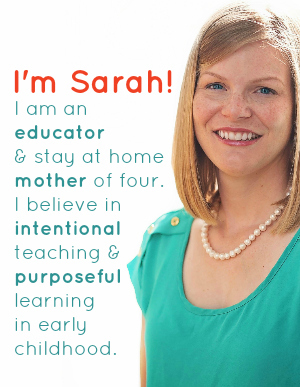 Many preschools spend the first half of the year focusing on teaching one to one correspondence and numbers 0-10. Now that spring is emerging, it’s certainly time for a little extra practice on learning teen numbers. 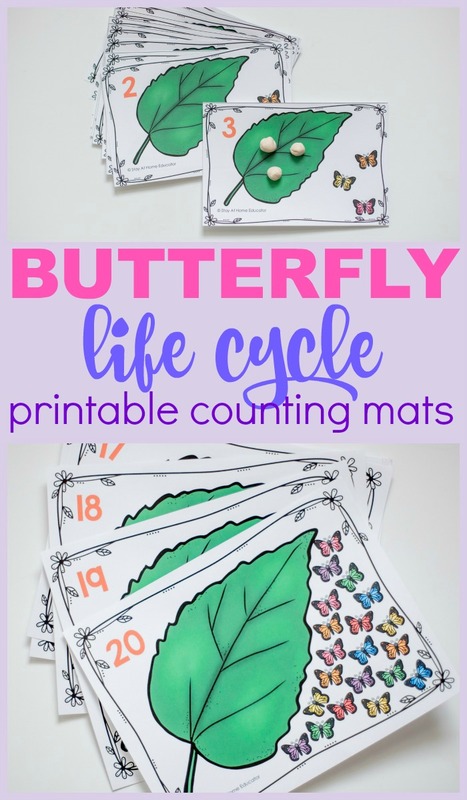 Teach teen numbers to preschoolers with these FREE butterfly life cycle printable counting mats. (And get a dose of preschool science, too). This post includes a FREE printable for preschoolers. Be sure to grab it from the end of the post. Have you ever raised butterflies with your preschoolers? It’s magical! You can order kits on Amazon where you receive several teeny tiny caterpillars, caterpillar food, a net cage and some powder to make a sugar solution for them the butterflies emerge. You get a handy little pamphlet explaining the intricate details of the transformation. Every year we raise some butterflies from their teeny caterpillar state, watch them much away at the provided food and then observe as they make their way to the top of the container to form that classic J shape as they create their chrysalis. And then we wait for our butterflies to emerge. And while we wait, we plant trumpet shaped flowers in the back yard garden so the new butterflies will have something to drink when they are ready to be released. In my experience, kids love learning about bugs. But let me tell you, there is nothing that compares to the excitement of a preschooler who is holding a butterfly on his finger. So yeah, we learn about butterflies in preschool every spring. We raise some and we play some, like with this fun butterfly craft. But any insects theme or spring theme needs some butterfly counting cards like these. 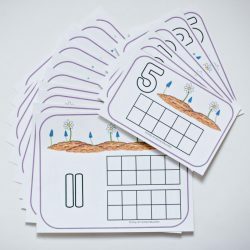 But here’s the thing, these butterfly counting mats are the perfect thing to teach teen numbers to preschoolers! And how fitting it’s spring related, too. Teaching teen numbers to preschoolers can have it’s challenges. One on one correspondence is learning to say each number while pointing at the object or manipulative that they are counting. It can take a preschooler the entire year to master one on one correspondence and counting. Including fun, engaging activities, though, is the perfect way to not only introduce the skill but help children master it as well. 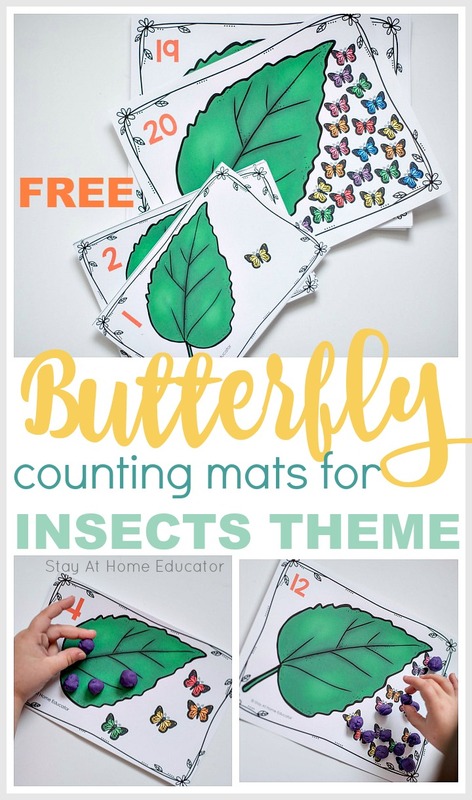 A set of pretty butterfly counting mats like these, your preschoolers will be on their way to learning their teen numbers with no trouble at all! These cards are also fantastic for strengthening fine motor skills! Fine motor skills are incredibly important for young children. These skills help strengthen the finger and hand muscles that are required for zipping a zipper, holding a pencil, and of course handwriting. When I can fit find motor strengthening into another activity, such as math or literacy, I will always do it! These counting cards work well with playdough but there are a ton of other ideas of what could be used to help with the one on one correspondence process like pom poms, butterfly counters, insect counters, beads, colorful counting chips, or even insect graham crackers! These cards go from 1 to 20. This helps students learn one on one correspondence through teen numbers. To get started with this fun printable butterfly activity, the first thing to do is print the cards. They come two on a page, so simply cut them apart when they are all printed. 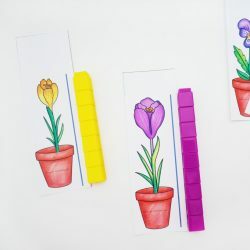 The lamination will not only protect the pages itself but will also allow children to use these cards with playdough, dry erase markers or dry erase crayons. If you prefer not to laminate or don’t have access to a lamination machine, that is absolutely okay! We also love dry erase pockets, they are also a fantastic alternative. Set the cards on a table or tray and with some playdough and invite your preschoolers to join you for some practice in teen counting! But to really prep my preschoolers, we read some picture books about butterflies and their lifecycle. 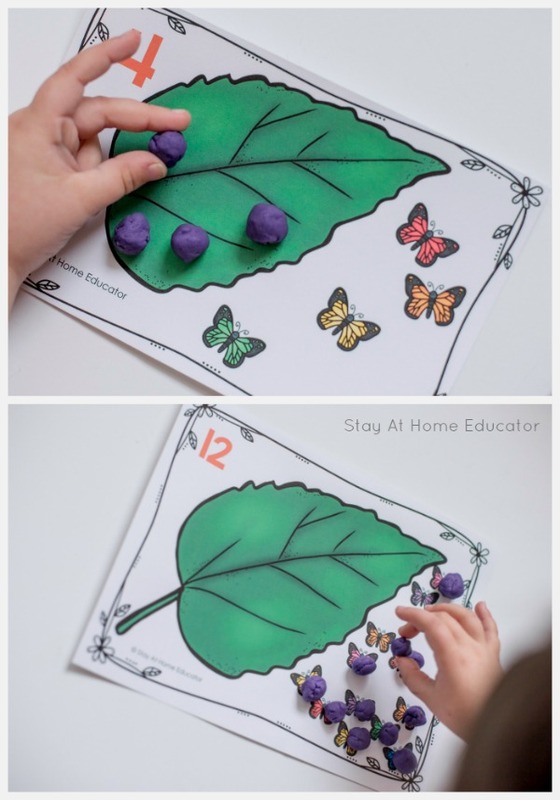 Playing with this printable butterfly activity is the best part. I have found that whether I am introducing a new idea or helping kids strengthen a skill, they do so much better with a hands on activity than with a worksheet. Worksheets do have their place but especially when introducing a new skill, engaging activities work better for us! Not only do hands on activities help children strengthen skills but they also appear, to children, as playing. 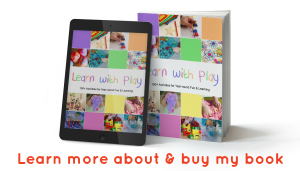 Learning through play is always a win! There are many ways that these cards can be used but the basic is to start one child with the first card. Start with card number 1. Have the child identify the number on the card. Next I like to have the child count the number of butterflies that are on the card. The number or butterflies, of course, corresponds to the number on each card, So below you can see that it is card 4. The number 4 is written and there are 4 butterflies. Next I will ask the child to create the correct number of playdough balls and place it on the leaf. The playdough balls look like and represent butterfly eggs. I ask them to count as they are placing the playdough, as well. That way you get to work in a little science too, especially if you did hatch butterflies with your preschoolers. 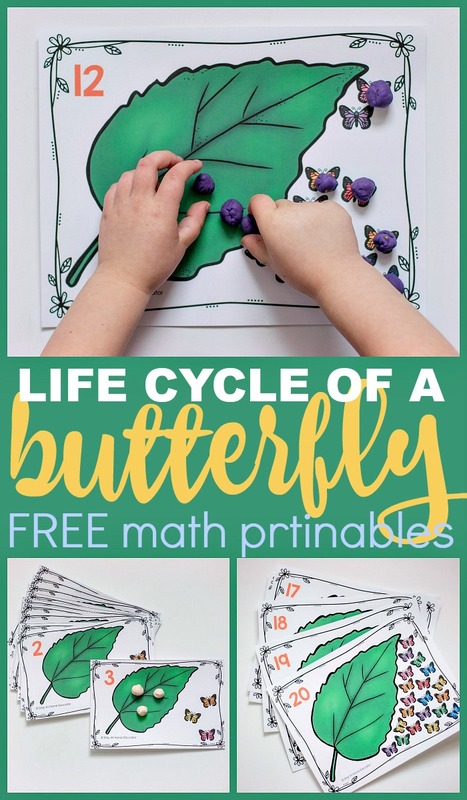 Some of my favorite things about this butterfly printable activity is that it can easily be done with individual students for math centers or in small groups. I also love that it can be added to many different themes. 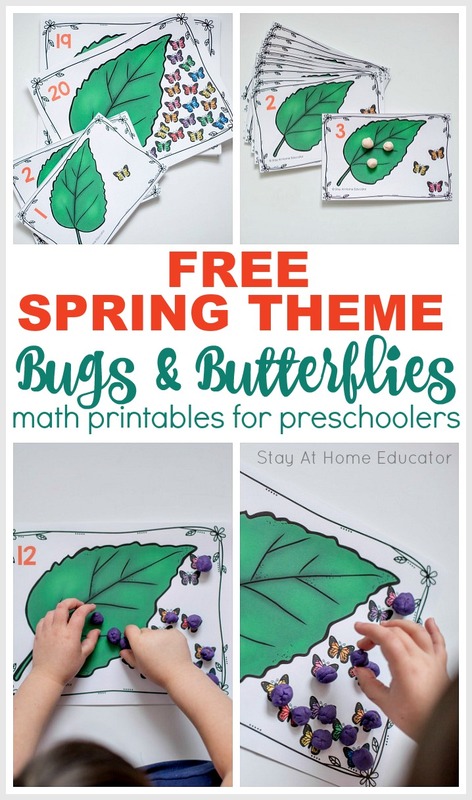 This butterfly activity can be integrated into a spring theme, insect theme, gardening theme, flowers theme, and more! You can also use these counting mats for simple addition and subtraction. You could ask the child to do the same tasks as above, but then combine two cards and ask them to add or subtract from there. 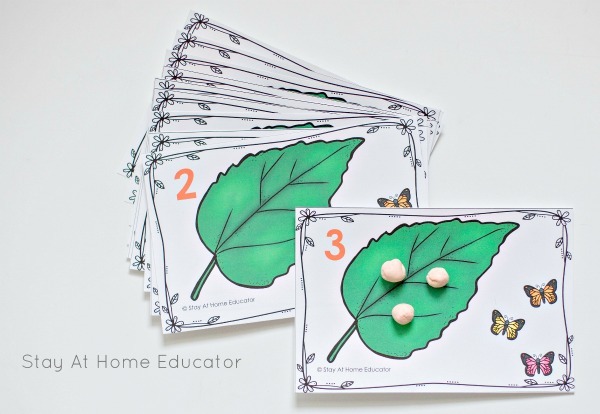 Of course these butterfly counting cards can be used in a lot of different ways. Here are some more ideas on how to use them with your preschooler. Get extra teen counting practice in by using a variety of manipulatives to continue interest. Sometimes if a preschooler doesn’t respond to an activity all you have to do is swap out a material. Try this activity with butterfly counters, insect counters, beads, colorful counting chips, or even insect graham crackers! If you have younger preschoolers, model an entire card for them, and then do a few cards along side them. Start with only a small handful of cards with numbers that have already been introduced. Use these cards as “number of the day” cards during your spring theme, insect theme, gardening theme, or flowers theme. Invite older preschoolers to sequence the cards in order from smallest to biggest. Be sure to follow this up with discussions about how when number increases they get bigger in quantity. Click to learn more about quantification in preschool. Use these cards for subitizing practice. 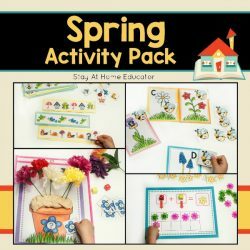 LOOKING FOR FREE SPRING THEME PRINTABLES FOR PRESCHOOLERS? 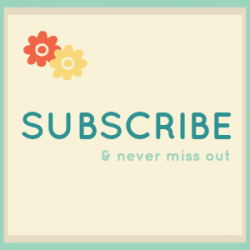 Just click the images below to grab your free printables for spring! Want Low-Prep Spring Theme Preschool Centers? 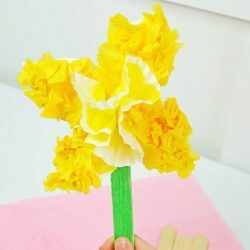 Prep all your preschool centers for you spring theme in less than an hour! 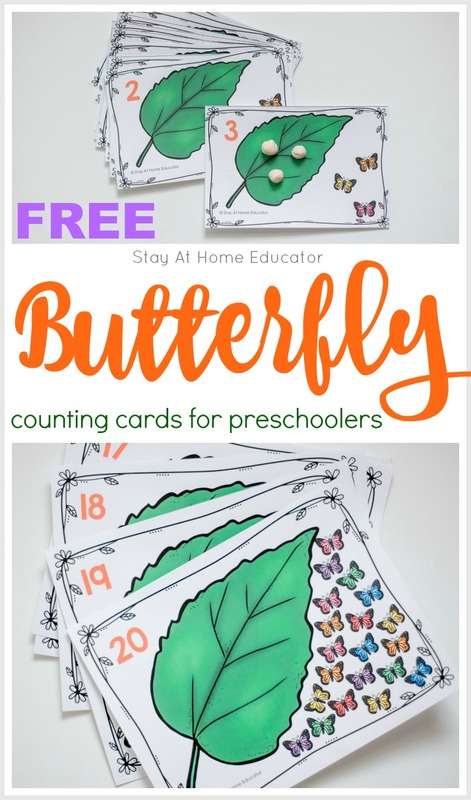 Grab Your FREE Butterfly Counting Cards Here! 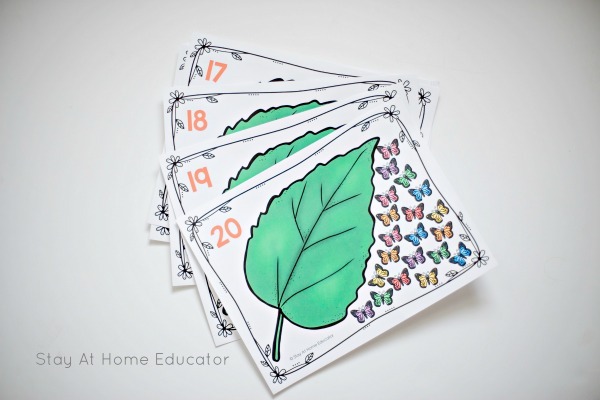 These counting cards are just right for spring or insects theme, and my preschoolers loved how they went all the way up to 20. You can grab your free printable by clicking the image below.